Every year, a committee of experts sits down with a tough job to do: from among all ICREA publications, they must find a handful that stand out from all the others. This is indeed a challenge. The debates are sometimes heated and always difficult but, in the end, a shortlist of 24 publications is produced. No prize is awarded, and the only additional acknowledge is the honour of being chosen and highlighted by ICREA. Each piece has something unique about it, whether it be a particularly elegant solution, the huge impact it has in the media or the sheer fascination it generates as a truly new idea. For whatever the reason, these are the best of the best and, as such, we are proud to share them here. Animal cells communicate through chemical signals that are essential for normal development and survival. When one such signal reaches a cell, it must be properly decoded to produce the correct response. Consequently, alterations in these signaling events can lead to multiple diseases, including cancer. We are studying a protein that functions as a nuclear sensor for the interpretation of the Ras-MAPK pathway, the most frequently mutated signaling pathway in human cancer. We identified this protein in the fruit fly Drosophila and dubbed it Capicua –the Catalan for ‘head and tail’– because embryos that lack Capicua function develop only a head and a tail without the normal middle body regions. The role of Capicua in Ras-MAPK signaling has been conserved throughout evolution and, accordingly, Capicua acts as a tumor suppressor in humans. 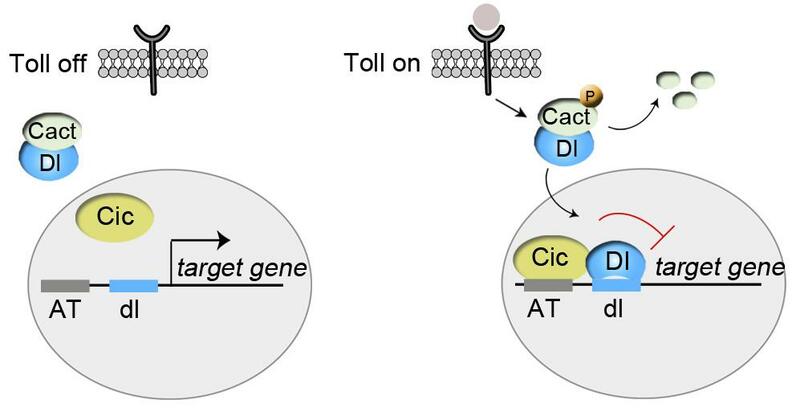 In this work, we have discovered a new role of Capicua in connection with another signaling pathway, the evolutionarily conserved Toll/Interleukin 1 cascade. In this context, Capicua regulates the distinction between dorsal and ventral regions of the Drosophila embryo. It does so by binding to and repressing specific target genes only when Toll/Interleukin 1 signaling becomes active in ventral regions (see the accompanying figure). These results reveal a new paradigm of cell signaling and gene regulation, while at the same time raising the possibility that Ras-MAPK-independent mechanisms may also underlie Capicua function in humans. Capicua represses Toll/IL-1 signaling targets via suboptimal, low-affinity sites (designated ‘AT’) that it cannot recognize on its own (left). Instead, Capicua DNA binding requires the Dorsal/NF-kB protein, which enters the nucleus upon Toll activation and binds next to the Capicua sites (right). Papagianni A, Forés M, Shao W, He S, Koenecke N, Andreu MJ, Samper N, Paroush Z, González-Crespo S, Zeitlinger J & Jiménez G 2018, 'Capicua controls Toll/IL-1 signaling targets independently of RTK regulation', Proceedings of the National Academy of Sciences USA, 115, 1807-1812. Since 2009, the Large Hadron Collider (LHC) at CERN collides protons at center-of-mass energies of up to 13 TeV, the highest energy ever reached by a particle accelerator. One of the main goals of the LHC has been the search for the Higgs boson, the last missing piece of the Standard Model (SM), our most successful theory of elementary particles. The Higgs boson is the particle associated with a quantum field postulated to permeate the Universe, and responsible for endowing elementary particles with their mass. On July 4th, 2012, under lots of excitement and extensive media coverage, the ATLAS and CMS experiments at the LHC reported the observation of a new boson with properties compatible with those of the SM Higgs boson, marking the beginning of a new era in particle physics. The ATLAS Collaboration has recently reported the observation of the production of the Higgs boson together with a pair of top quarks, known as “ttH” production . Only about 1% of all Higgs bosons are produced through this rare process, and scientists have searched for them exploiting most of the Higgs boson decay modes: to two W or Z bosons, to a pair of tau leptons, to a pair of b-quarks, and to a pair of photons. The combination of these searches has reached a significance of 6.3 standard deviations, providing a first direct measurement of strength of the interaction between the top quark and the Higgs boson, known as the “top quark Yukawa coupling”. As the top quark is the heaviest particle in the SM, this measurement is one of the most sensitive tests of the Higgs mechanism. Since 2011, IFAE scientists, under Prof. A. Juste’s leadership, are playing a major role in the search for ttH production with the Higgs boson decaying into a pair of b-quarks . 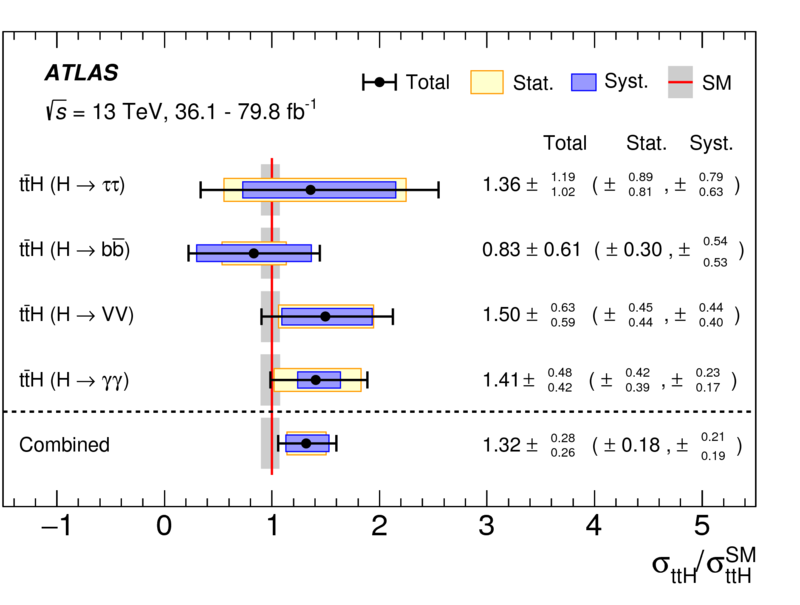 Recently, the IFAE team joined the analysis targeting Higgs boson decays into a pair of W/Z bosons or a pair of tau leptons , which holds great potential for a more precise measurement of the top quark Yukawa coupling using the ever-increasing data samples cumulated by the ATLAS experiment. Such measurement could shed new light on the nature of the Higgs boson and possibly reveal traces of new and unknown particle species. Comparison between the observed and predicted number of events across all analysis categories in a variable that ranks events according to their expected signal-to-background ratio (S/B). At high values of this variable a clear excess of data over the background prediction is observed, which can be explained by the ttH signal. Two different signal predictions are shown: the Standard Model prediction for the ttH cross section (denoted μ=1) and the measured ttH cross section (denoted μ=1.32, meaning 1.32 times the Standard Model prediction). The error bars on the data represent the statistical uncertainties. Combined ttH production cross section, as well as cross sections measured in the individual Higgs boson decay channels, divided by the Standard Model cross-section prediction. The black lines show the total uncertainties, while the bands indicate the statistical and systematic uncertainties. The red vertical line indicates the Standard Model cross-section prediction, and the grey bands represent its associated uncertainties. ATLAS Collaboration, “Observation of Higgs boson production in association with a top quark pair at the LHC with the ATLAS detector“, Phys. Lett. B 784 (2018) 173. 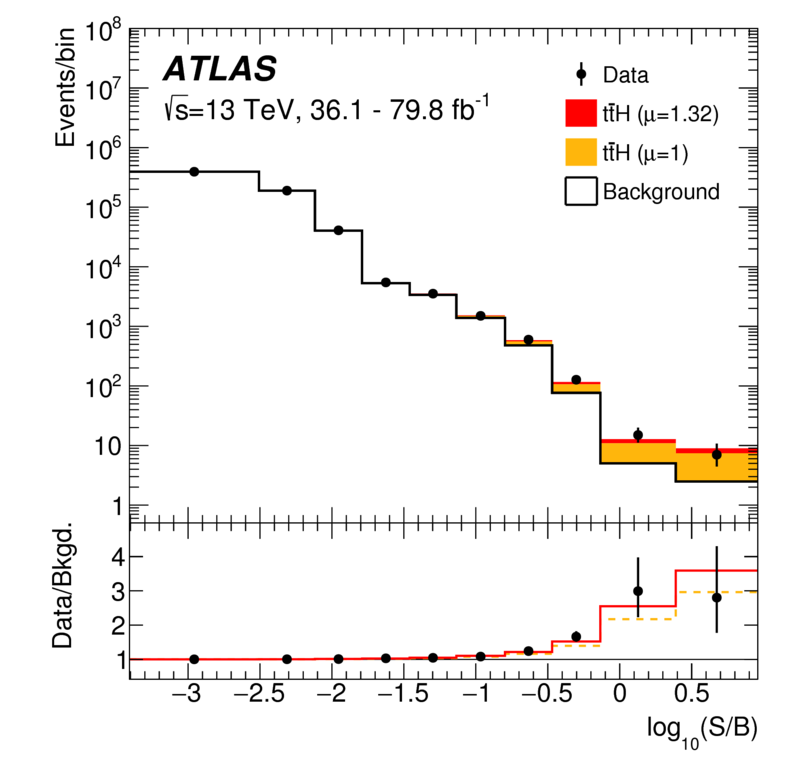 ATLAS Collaboration, “Search for the Standard Model Higgs boson produced in association with top quarks and decaying into a bb pair in proton-proton collisions at 13 TeV with the ATLAS detector”, Phys. Rev. D 97 (2018) 07201. ATLAS Collaboration, “Evidence for the associated production of the Higgs boson and a top quark pair with the ATLAS detector”, Phys. Rev. D 97 (2018) 072003. 2018 saw the publication of the volume of essays 'Hearing the City in Early Modern Europe' in the prestigious Épitome Musical series for Brépols. This book, including 21 essays by leading international specialists in the field of urban history and musicicology, resulted from the ICREA International Workshop I organized in September 2015 in the Institut d'Estudis Catalans in Barcelona with the title 'Hearing the City: Musical Experience as Portal to Urban Soundscapes'. The essays were edited by myself and my former research assistant Ascensión Mazuela-Anguita on the Marie Curie research project 'Urban Musics and Musical Practices' (CIG-2012) and we both contributed essays based on recent research undertaken for that project in Barcelona archives. 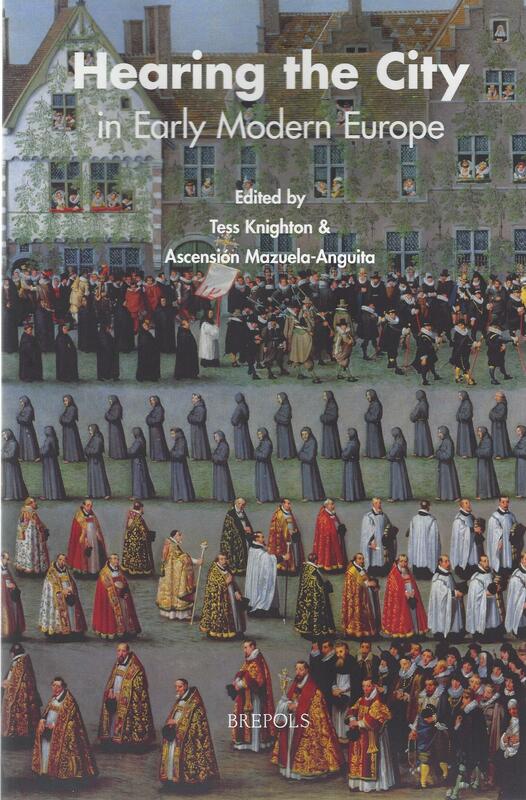 These highly original and often ground-breaking essays range from studies of fifteenth-century Vienna to late-eighteenth-century Naples, and other European and Iberian cities such as London, Hamburg, Zurich, Palermo, Rome, Lisbon, Madrid, Pamplona, Úbeda, Valencia and Barcelona as well as global cities such as Manila. The volume opens with a brilliant summary of the state-of-the-art in the field of urban musicology by Tim Carter and concludes with an analysis of the digital platform 'Historical Soundscapes' created by Juan Ruiz Jiménez. The collection of essays 'Hearing the City' that resulted from the ICREA International Workshop of the same title. Hipparions, the classical three-toed horses, repeatedly evolved dwarf forms, some of them as small as medium-sized dogs. Such size shifts are not unusual amongst insular mammals (fossil and extant), but they are less frequent in continental settings. Dwarfism on islands is commonly considered as a result of low resource availability directly limiting body size; however a more recent model by Palkovacs (2003) proposes that selection instead may act on key life cycle traits such as age at maturity or the age at first reproduction, and that shifts in body size are a simple byproduct. This approach has predictive power and enjoys empirical support. It allows a better understanding of the environmental conditions as it predicts the magnitude of selection pressure exerted by either predation or resource availability. We adopted this approach to predict the paleoenvironment of continental dwarf hipparions from Eastern and Western Mediterranian bioprovinces, where the ecological conditions are still heavily debated. We reconstructed growth rates from bone histology for different-sized hipparionins from Greece and Spain, and found that dwarfing was triggered by different mechanisms in these regions. While Greek hipparions ceased growth early at a small size, thus advancing maturity, Spanish hipparions grew at slower rates and matured later, however at a similar small size. Based on Palkovacs' model, we infer that the Greek dwarfs suffered high adult mortality by predation, while the Spanish dwarfs faced low resource supply associated with high juvenile mortality. We conclude that different selective pressures - high predation pressure, low resource availability - trigger different changes in key life history traits (age at maturity) that result in similar shifts towards smaller size. Thus, there is no direct relation between observed body size and environmental conditions as hitherto believed, which calls for analyses within the framework of life history theory to resolve the mechanisms underlying size changes. Three-toed horses (hipparions) repeatedly evolved dwarf forms. 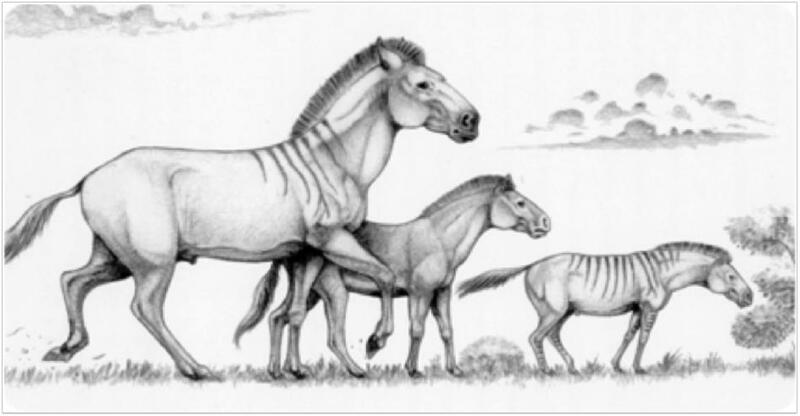 In our study, we analyzed "large" forms that were slightly smaller than extant small horses and donkeys (150-200kg), middle-sized forms between 60-90kg, and dwarfed forms of no more than 23kg. Illustration: courtesy of Israel M. Sánchez. Orlandi-Oliveras G, Nacarino-Meneses C, Koufos GD & Köhler M 2018, 'Bone histology provides insights into the life history mechanisms underlying dwarfism in hipparionins' Scientific Reports 8:17203. Phonons, that is, excitations of modulations of the crystalline lattices being the basic structures of solid state, play fundamental role in condensed matter physics, leading to various phonon induced phenomena from semiconduction to Peierls instability, i.e., formation of antiferromagnetism, and topological order. We have introduced a family of lattice models were phonon dynamics is reduced to that of two state models. This allows to simulate such systems efficiently in one or two dimensions and study their peculiar properties, such as spontaneous formation of stable antiferromagnetism, formation of topological order, etc. A dynamical lattice is simulated using a set of two-level atoms (orange) deeply confined in an optical lattice. Another lattice traps itinerant bosons (green) that interact among them and with the lattice, giving rise to a bosonic Peierls insulator. González-Cuadra D, Grzybowski P.R, Dauphin A & Lewenstein M 2018,"Strongly correlated bosons on a dynamical lattice", Physical Review Letters vol 121, 090402. Meters of DNA are highly compacted into each cell’s nucleus. The most basic structure of this compaction are nucleosomes. 147 bps of DNA wrapped around proteins called histones. Every 10bps, the minor groove of the DNA faces towards or away from histones. Through the study of the distribution of somatic mutations in more than 3,000 human tumours, we have discovered that this 10bp periodic structure of the DNA around nucleosomes produces a periodicity in the rate of generation of somatic mutations. The periodic pattern was also observed in germline mutations, which are passed on to the offspring. Along the genomes of eukaryotes, A/T di-nucleotides are more likely to occur with a10bp- periodicity (WW periodicity) , which has long been associated to the presence of nucleosomes. This WW periodicity has been speculated to have arisen through selection of mutations conducive to sequences that favor the bending of DNA around nucleosomes. We propose that the periodic rate of somatic and germline mutations that we observed could have contributed through evolutionary time to the generation of the WW periodic pattern in the genomes of eukaryotes (Figure). The findings presented here have strong implications for understanding mutational and repair processes in human DNA, understanding the evolution of eukaryotic genomes, and for the study somatic and germline evolutionary processes. Schematic representation of alternating sequences of DNA with minor groove facing toward and away from histones. 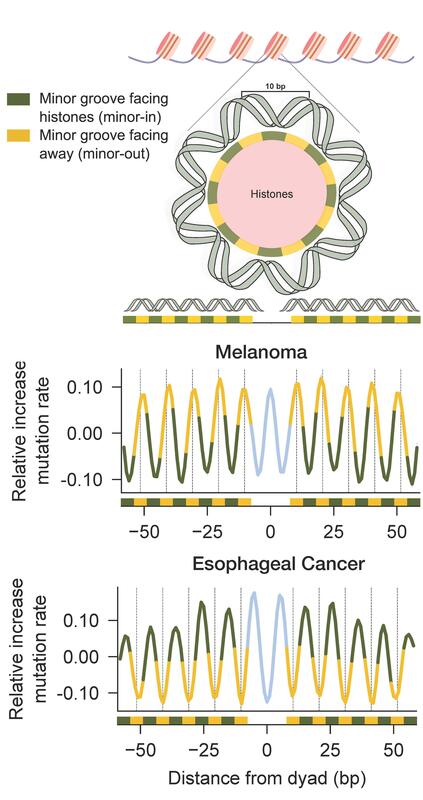 Periodicity of the relative increase of mutation rate in melanoma and esophageal cancer. Pich O, Muiños F, Sabarinathan R, Reyes-Salazar I, Gonzalez-Perez A & Lopez-Bigas N 2018, 'Somatic and Germline Mutation Periodicity Follow the Orientation of the DNA Minor Groove around Nucleosomes', Cell, Vol. 175, no4, 1, pp 1074-1087.e18.